Players who score 50 goals in a season are considered elite scorers. Throughout the league’s 101-year history, 91 unique players have combined to reach the 50-goal plateau 194 different times. The Pittsburgh Penguins, while not joining the NHL until the expansion wave of 1967, have nine players who’ve combined to reach this plateau 16 times. Except for the two seasons they played in the 1960s, the franchise has had a 50-goal scorer in each full decade they’ve been around. The Penguins weren’t a model of success over their first decade and a half of existence, but that didn’t stop them from having stars. Although they didn’t draft Pronovost, they liked what they saw from him as a member of the Oklahoma City Blazers of the Central Professional Hockey League and acquired his NHL rights from the Boston Bruins in May 1968 in exchange for a 1969 first-round draft pick and cash. Pronovost, a member of the “Century Line,” along with Lowell McDonald and Syl Apps Jr., became the first player in Penguins history to record a 50-goal season on Mar. 24, 1976, when he scored during a 5-5 tie against the Bruins. In 80 games, Pronovost scored 52 goals and crossed the 100-point plateau for the only time in his career. While he only reached these numbers once, Pronovost was an impact player. He scored 20 or more goals nine times, his rookie season is the only exception, and he recorded 40 or more points in all ten of his seasons with the team. Pronovost is considered one of the better two-way forwards of his era. He likely would’ve been in contention for the Selke Trophy had it been introduced earlier than the 1977-78 season, when he was 32 years old. 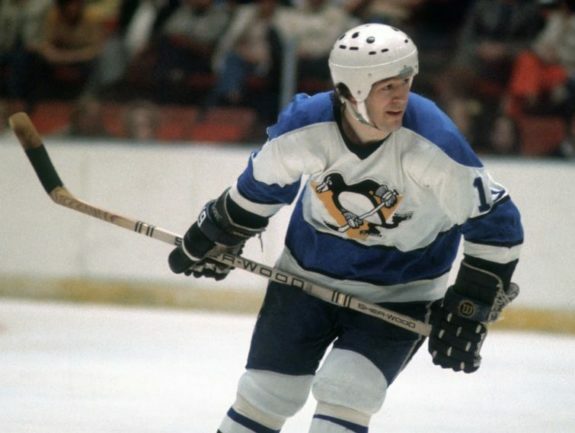 Pronovost’s time with the Penguins ended on Sep. 6, 1978 when he was sent to the Atlanta Flames for Gregg Sheppard. At the time of his departure, he was the franchise leader in goals (316), points (603), power-play goals (69) and games played (753). He still ranks in the top-10 in all of these categories as of March 2019. Pronovost retired from hockey after the 1981-82 season, following stints with the Calgary Flames and Washington Capitals, with 774 points in 998 games over 14 NHL seasons. He only spent three seasons with the Penguins after being their first-round pick in the 1974 Draft, but LaRouche made his time count. He lost out on the Calder Trophy despite scoring a rookie-high 68 points during the 1974-75 season, but he used it as motivation going forward. Before his sophomore season, LaRouche said he’d score 50 goals, and he made good on his prediction by recording a then-franchise record 53 goals and 111 points in 76 games during the 1975-76 season. In the same game that Pronovost became the first Penguin to score 50, LaRouche became the first to record 100 points. He then joined the 50-goal club on Apr. 3, 1976, scoring twice in the Penguins’ 5-4 loss to the Capitals. LaRouche played one more full season in Pittsburgh before being traded along with the rights to Peter Marsh to the Montreal Canadiens on Nov. 29, 1977, in exchange for Pete Mahovlich and Peter Lee. 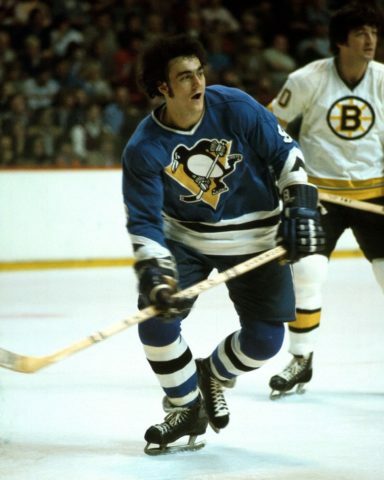 While Mahovlich tallied 114 points in 117 games and Lee topped the 50-point plateau twice in six seasons, the trade was still a loss for the Penguins. LaRouche went on to help the Canadiens win back-to-back Stanley Cups in 1978 and 1979 and added his second career 50-goal season in 1979-80. In his time with the Penguins, LaRouche recorded 119 goals and 253 points in 240 games. He scored 25-plus goals in each season while showcasing a quick release akin to other former Penguins, James Neal and Rick Kehoe. LaRouche scored 395 goals and 822 points in 812 games over his 14-season career with the Penguins, Canadiens, Hartford Whalers and New York Rangers. Fun fact: He set the QMJHL’s single-season points record with 251 in the 1973-74 season only to have Mario Lemieux break it a decade later when he recorded 282 points during the 1983-84 season. When younger Penguins fans think of consistent production, they may think of Phil Kessel. When older fans think of it, they may think of Kehoe. Oddly, both were acquired from the Toronto Maple Leafs after rough offensive seasons, albeit 41 years apart. While he played in the days when physicality trumped all, Kehoe’s 5-foot-11, 190-pound build didn’t strike fear into the hearts of opponents. However, his lethal shot did. He failed to score more than 25 goals once during his ten full seasons as a Penguin. He scored more than 30 goals five times and became a member of the 50-goal club when he recorded 55 during the 1980-81 campaign. That included career-high goal totals at even strength (35), on the power play (20) and game-winners (five). He also won the Lady Byng Trophy, the only award of his career. Kehoe’s goal and point totals declined over the next three seasons as the Penguins had a youth movement. He was forced to retire early in the 1984-85 season at the age of 33 after damaging the vertebrae in his neck, which threatened his quality of life. He recorded 371 goals and 767 points over 906 games during his 14-season career between the Leafs and Penguins. After his retirement, Kehoe was named the Penguins’ Director of Pro Scouting. He was also an assistant coach on the 1991 and 1992 Stanley Cup champion teams. He briefly served as the team’s head coach from the 2001-02 season through 2002-03, where he compiled a 55-81-14-10 record over 160 games. Long before the NHL stopped giving the worst team in the NHL the first overall draft pick, the 1983-84 Penguins existed. While it was obvious the team was tanking for Lemieux, the top-rated prospect in the 1984 Draft, nobody was going to admit it. However, the strategy worked as the Penguins went 16-58-6 for a franchise-worst 36 points. They got the number one pick, drafted Lemieux and the rest is history. ‘I got my 50th goal in L.A. with six games left,’ Bullard said. ‘I’m jumping up and down like crazy, and the people in L.A. were saying, “What’s this guy doing? His team is the worst in the league,’ (from ‘Back in NHL Days, Caledonia coach Mike Bullard Scored 51 Goals for “Tanking” Team’ — The Hamilton Spectator — 4/29/16). It was the only 50-goal season of Bullard’s career, but he wasn’t a one-off. He set the Penguins’ rookie record for goals with 36 in 1981-82 before Lemieux surpassed him. Bullard also scored 30 or more goals in four of his seven seasons in Pittsburgh and 185 total in 382 games before being traded to the Flames for Dan Quinn in Nov. 1986. Despite missing 479 games over his 17-season career, Lemieux is the greatest Penguin of all-time and one of the best players in NHL history. The Penguins’ co-owner was a goal scorer, too. Lemieux’s 690 career goals rank 10th in NHL history, and his .754 goals-per-game (G/GP) average ranks second all-time behind Mike Bossy’s .762 G/GP. He’s the only player to score 30 or more power-play goals in a season and one of two players to score ten or more shorthanded goals multiple times in their career, Wayne Gretzky being the other. Lemieux scored 50 goals six times and was on pace to do it another five times had he played the full season. In the six campaigns when he surpassed 50, he scored 60 twice and is one of only three players with multiple 70-goal seasons and one of three to score 80 in a season. If the Maurice ‘Rocket’ Richard Trophy had existed during his prime seasons, he would’ve won the award three times and was on-pace to win it another three. Lemieux became a member of the 50-goal club for the first time during the 1986-87 season when he scored 54 goals in 63 games. He also notched 53 assists, the only time he finished with more goals than assists. He entered the 70-goal club during the 1987-88 season, scoring 70 in 77 games, including ten shorthanded markers, en route to winning his first career Hart and Art Ross Trophies. The 1988-89 season remains among one of the most dominant in NHL history. He scored a league-leading 85 goals, including 31 on the power-play and 13 shorthanded, and added 114 assists for 199 points in 76 games. On Dec. 31, 1988, against the New Jersey Devils, Lemieux became the first and only player in NHL history to score five goals in all five possible ways: even-strength, shorthanded, power play, penalty shot and on an empty net. 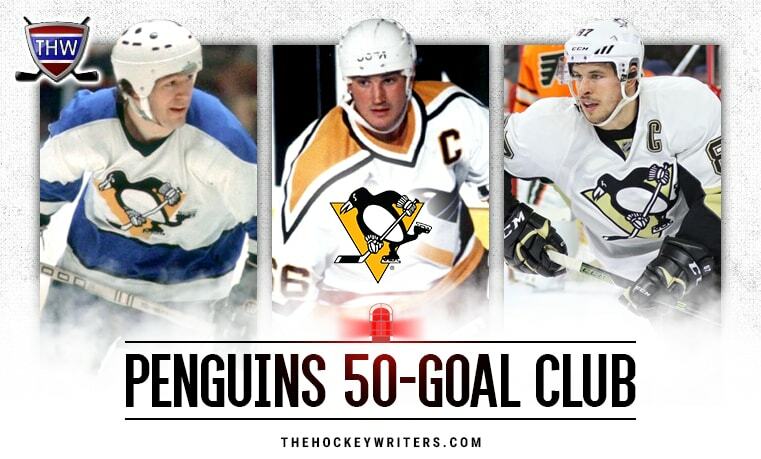 He joined the 50 goals in 50 games club less than a month later, scoring his 50th goal in his 44th game of the season (the Penguins’ 46th game) at the 1:18 mark of the first period in a 7-3 loss to the Winnipeg Jets on Jan. 20, 1989. Lemieux had a hand in 57.3 percent of the Penguins’ goals, the highest percentage in league history. He repeated as the league’s scoring champion but lost the Hart to Gretzky, who finished with 31 fewer points. Lemieux missed out on 50 goals over the next three seasons because of a chronic back problem. He scored 45 in 59 games during the 1989-90 season, which included a 46-game point streak when he had 103 points despite being unable to tie his skates. He returned to the 50-goal club in 1992-93. He began the season with 39 goals and 104 points in 40 games, putting him on pace to become the second player in league history to record 200 points in a season. Those dreams were put on hold on Jan. 12, 1993, when the Penguins announced he had been diagnosed with Hodgkins Disease and would be out of the lineup as he began radiation treatment. After his final treatment on Mar. 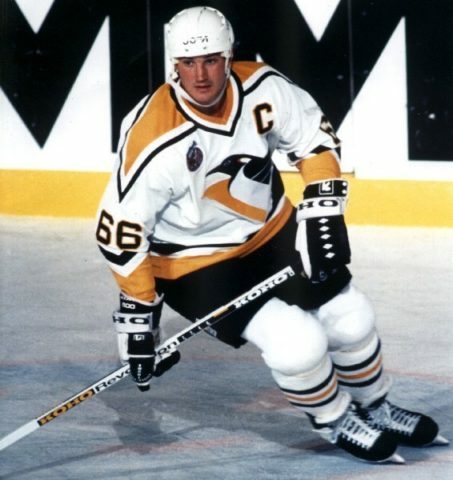 2, Lemieux was in the Penguins’ lineup that night against the Philadelphia Flyers. He finished the game with a goal and an assist and received a standing ovation from the Flyers faithful, something that had never happened during the Penguins-Flyers rivalry. Down 12 points to Pat Lafontaine of the Buffalo Sabres in the scoring race on his return, Lemieux recorded 30 goals and 56 points in his final 20 games to win the scoring title by, interestingly, 12 points. He also won the Hart and Bill Masterton Trophies along with the Lindsay. He’s one of those special players who comes around once in a blue moon. To cap off that season the way he did and the way he did it … incredible. Just going through what he went through made it that much more of a special story for so many people. I would have given up all my 148 points that season if it meant beating Montreal in the playoffs, but I was happy for Mario’s story and how he showed the courage to come back in overcoming lymphoma and to know that was the inspiration for a lot of people. It was a special season for sure. Lemieux’s final 50-goal season came in 1996-97, his last before his first retirement. He scored 50 in 76 games and won his final scoring title with 122 points. That season, Lemieux also scored his 600th career goal on an empty net at 19:04 of the third period during the Penguins’ 6-4 victory over the Vancouver Canucks on Feb. 4, 1997. He was the second-fastest player to reach the milestone, scoring his 600th goal in his 719th career game, one behind Gretzky’s 600 in 718 games. After coming out of retirement on Dec. 27, 2000, Lemieux scored 35 goals in 43 games over the remainder of the 2000-01 season, a 68-goal pace over 82 games. Had he reached the 50-goal mark, he would’ve tied Johnny Bucyk as the oldest player to do so. After a few more seasons and some more health issues, Lemieux retired for good on Jan. 24, 2006 at the age of 40. In over 915 games, Lemieux recorded 690 goals, 1,033 assists and 1,723 points. One of the best trades the Penguins ever made was for Stevens, whom they acquired for Anders Hakansson on Sept. 9, 1983, three months after Stevens was selected in the sixth round of the 1983 Draft by the Kings. Hakansson recorded just 61 points in 191 games with the Kings and was out of the league by 1986. Stevens, on the other hand, went on to be one of the most feared power forwards of the early 1990s as part of the Penguins’ powerhouse roster. He put up impressive numbers over his first few seasons with John Cullen and Mark Recchi, but Stevens truly broke out after he joined Lemieux’s line. 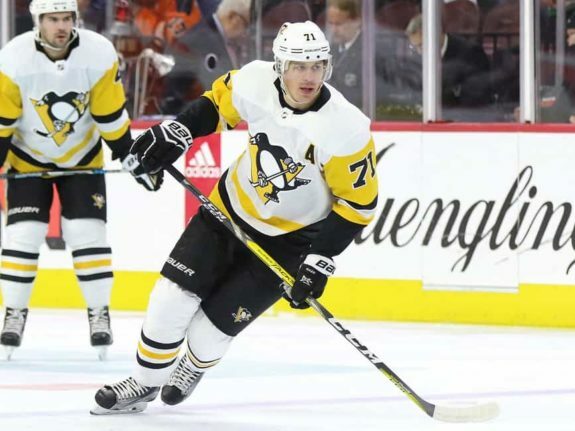 Playing with an all-time great will help, but Stevens was a special talent, and they helped make each other better; like Chris Kunitz and Jake Guentzel alongside Sidney Crosby decades later. Stevens’ rise to stardom began during the 1991 Playoffs when he recorded 33 points in 24 games to help the Penguins win their first of two consecutive Stanley Cups. During the 1991-92 season, Stevens had his first 50-goal campaign when he recorded 54 goals and 123 points in 80 games despite racking up 254 penalty minutes. The next season, Stevens again was a member of the 50-goal club, scoring a career-high 55 goals and 111 points in 72 games. He had a case to be named team MVP that season as he was crucial in keeping the Penguins afloat while Lemieux battled cancer. Lemieux was complimentary of his sidekick and believed he was among the league’s best: “He developed into this beast who could skate, hit and shoot. 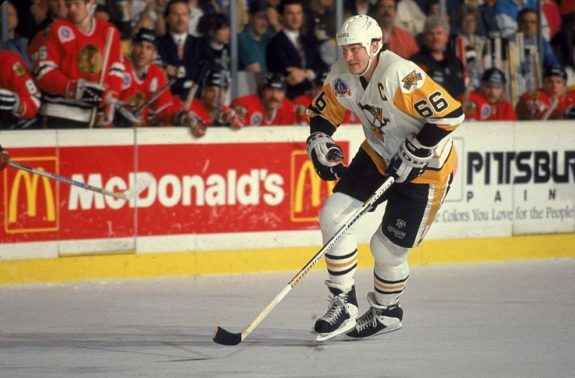 He had all the tools to be the best left-winger, which I think he was, for a few years in the NHL,” Lemieux said. 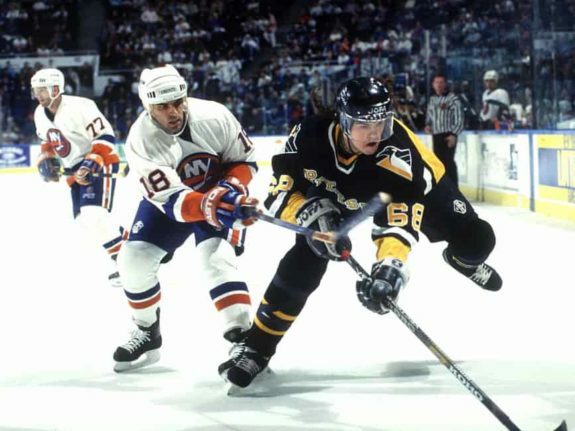 Stevens’ career changed during Game 7 of the Penguins’ second-round matchup with the New York Islanders in 1993. He went in for a hit on Islanders defenseman Rich Pilon but was knocked unconscious during the collision as he fell face-first onto the ice. Stevens broke his orbital bone, nose, cheek, lost some teeth and required surgery to fix the damage to his face. He returned the following season and still averaged a point per game, but he wasn’t the same player. While he remained productive for multiple seasons, the 1993 injury was the beginning of a 25-year battle with addiction that destroyed his career. A 2018 feature by Sportsnet chronicles Stevens’ struggles and his recovery from addiction. Stevens never scored more than 25 goals after his 41-goal, 88-point season, in 1993-94, nor did he record more than 45 points. On Aug. 2, 1995, he was traded to the Bruins for Glen Murray, Bryan Smolinski and a 1996 third-round pick. Following stops with the Bruins, Kings, Rangers, Flyers and a second stint with the Penguins, Stevens retired from hockey after the 2001-02 season. In 874 career games, he scored 329 goals, 397 assists, and 726 points. Drafted fifth overall in 1990, it took Jagr a few seasons to develop into the star fans came to love over his 23-season career. Once he did, he was one of the most dominant players in franchise history. Jagr’s goal totals hovered around the high-20s to low-30s over his first five seasons. If the lockout hadn’t delayed the beginning of the 1994-95 season, his 32 goals in 48 games would’ve equaled 55 over a full season. Nevertheless, he was forced to wait until the 1995-96 season, when he captured his 50th goal of the season on Feb. 23, 1996, against the Whalers. He became the first Czech-born player to score 50 in a season in the process and gave a blunt answer when asked about the accomplishment after the game. There haven’t been that many Czechs that have played the game, (from Lemieux and Jagr Reach 50 Goal Plateau — Los Angeles Times — 2/23/96). Jagr became the Penguins’ go-to guy when Lemieux retired after the 1997 Playoffs. He responded by winning three consecutive scoring titles but was unable to crack the 50-goal plateau again until Lemieux returned during the 2000-01 season. Jagr started the season with 19 goals and 37 points in 36 games, but his numbers took off following Lemieux’s December return. Over his final 45 games, he scored 33 goals and 84 points to finish the season with 52 goals and 121 points en route to his fourth consecutive scoring title. It turned out to be his final season in Pittsburgh. Due to the Penguins’ financial struggles and his public wishes to be traded during the season, Jagr was shipped to the Capitals on July 11, 2001, in exchange for prospects Kris Beech, Michal Sivek and Ross Lupaschuk. It was one of those trades that everybody knew would be a losing one at the time, but it had to happen. In the end, it all turned out well as their proceeding basement-dwelling allowed them to draft Crosby and Evgeni Malkin over the next half-decade. Including a three-season stint in the KHL, Jagr managed to play 12 more seasons with the Capitals, Rangers, Flyers, Dallas Stars, Bruins, Devils, Florida Panthers and Flames. The 47-year-old still plays professional hockey in the Czech Republic, but his NHL career is likely finished after 766 goals and 1,921 points in 1,733 games over 24 seasons. 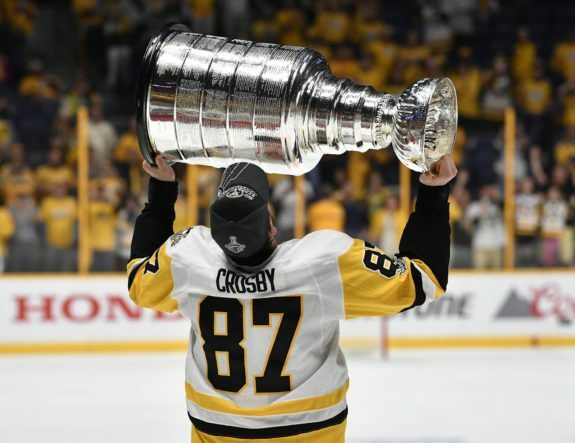 By the time he was 22 years old, Crosby already had multiple 100-point seasons, an Art Ross and Hart Trophy, a Ted Lindsay Award, a Stanley Cup and an Olympic Gold medal, so why not add a 50-goal season and a Rocket Richard Trophy to that list? He accomplished both during the 2009-10 season, scoring a career-high 51 goals in 81 games to become the co-scoring champion with Steven Stamkos of the Tampa Bay Lightning. Crosby scored his 50th goal at 17:03 of the first period during the Penguins’ final game of the season on April 11 against the Islanders. He then added his 51st of the season 55 seconds into the second period. In total, Crosby finished the game with five points and the season with 51 goals, 58 assists and 109 points. He became the seventh player in team history to record 50 goals and 50 assists in the same season, joining Pronovost, LaRouche, Stevens, Lemieux (six times) and Jagr (twice). He also joined the 500-career point club just three days earlier on April 8 against the same Islanders. The next season, Crosby was on a strong run with 32 goals in the first 41 games of the season and would’ve renewed his 50-goal club membership had he not suffered two hits to the head in five days from the Capitals’ David Steckel and the Lightning’s Victor Hedman. The ensuing concussions kept him out for all but eight games over the next 14 months, raising questions about his playing future. Crosby kept playing and has accomplished a few more feats along the way. He won his second career Rocket Richard Trophy with a 44-goal performance during the 2016-17 season, when he also led the Penguins to their second of back-to-back Stanley Cups. He joined the 400-career goal club on Feb. 11, 2018 against the St. Louis Blues, and has 444 career markers in 937 games. Despite being frustrating to watch at times, Malkin is on the Mount Rushmore of Penguins along with Lemieux, Jagr and Crosby. So, it’s only fair for him to be in the 50-goal club with them. After suffering a torn ACL and MCL that prematurely ended his 2010-11 season, Malkin returned with one of the best seasons of his career. He scored 50 goals and 109 points en route to his second career scoring title and first career Hart Trophy and Lindsay award. He also added a single season, career-high three hat tricks for good measure. 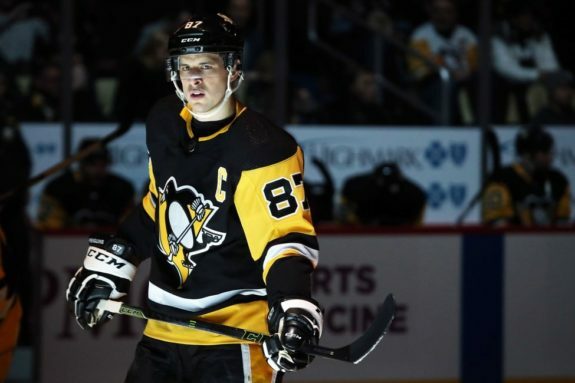 After scoring 47 goals in his sophomore season, Malkin’s goal totals declined to 35, 28 and 15 in each of the three seasons leading up to his 50-goal campaign. Entering the final game of the season against the Flyers with 49 goals, Malkin got his 50th at 19:48 of the second period, firing a wrister past the blocker of Sergei Bobrovsky. In the process, he also became the seventh Penguin to enter the 50/50 club joining Pronovost, Stevens, LaRouche, Lemieux (six times), Jagr (twice) and Crosby. Playing with Crosby for his entire career has left Malkin as one of the most underrated players of all time. When he’s at the top of his game, it’s nearly impossible to stop him, as we’ve seen during past regular seasons and playoff runs. It’s why the Penguins have won three Stanley Cups in the last decade. Through 851 career games, Malkin has 391 goals and 1,001 points, which puts him on the cusp of entering the 400-goal club as soon as next season. If there’s a franchise who’s been spoiled with talent throughout their existence, it’s the Penguins.